Fancy coloured diamonds are found in a variety of breathtaking colours including yellow, green, orange, pink, red, brown, blue and black, each with varying intensity levels. Their rarity, limited locations and sparkling beauty make them highly valuable and desirable across the globe. This guide outlines some of the different types of fancy coloured diamonds available on the market. In diamonds, rarity equals value. 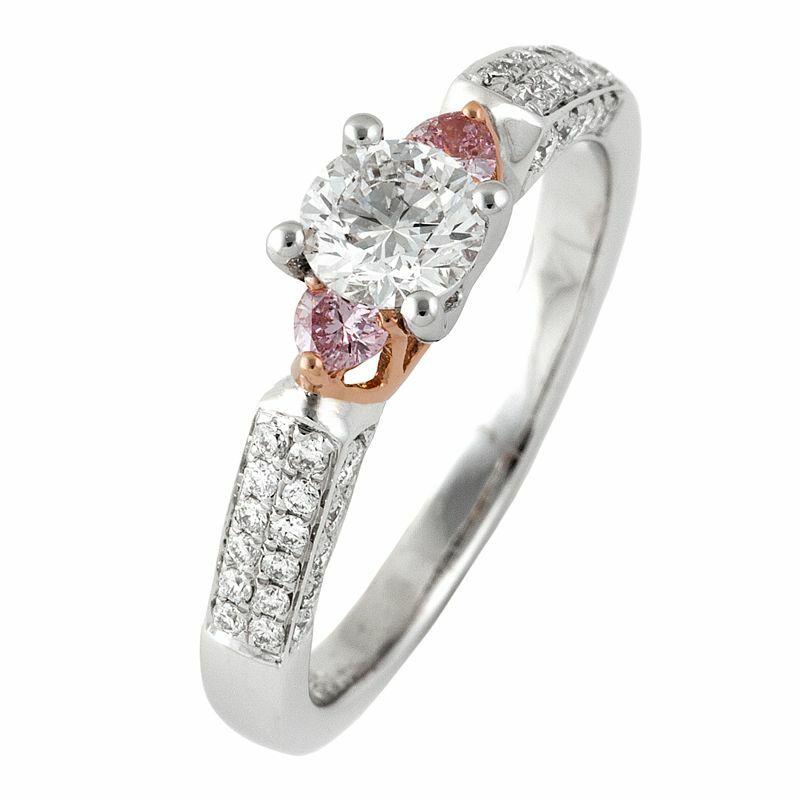 With diamonds in the normal range, value is based on the absence of colour, because colourless diamonds are the rarest. 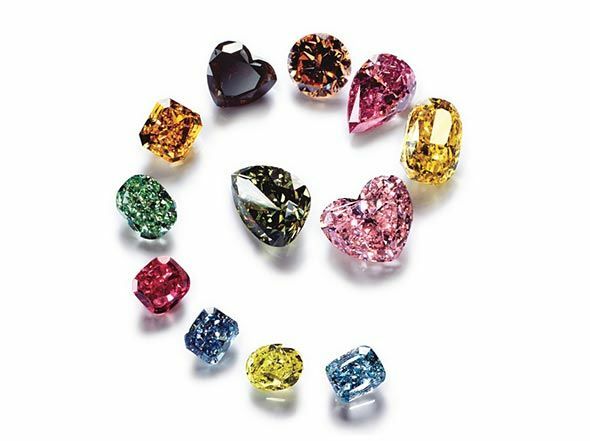 With fancy colour diamonds—the ones outside the normal colour range—the rarest and most valuable colours are saturated pinks, blues, and greens. In all cases, even very slight colour differences can have a big impact on value. With the Argyle diamond mine expected to cease operation within the next ten years, demand for pink diamonds has never been higher. If you’re interested in pink diamonds either as an investment or featured in hand-crafted jewellery, view our collection here. Yellow is diamond’s second most common fancy colour. Yellow diamonds are sometimes marketed as “canary.” While this isn’t a proper grading term, it’s commonly used in the trade to describe fancy yellow diamonds. Yellow diamonds are deemed “Fancy” when a stone displays more colour that the “Z” colour grade based on the GIA colour grading scale used to grade colourless diamonds. (NB: colourless diamonds are graded in the face down position, while fancy coloured diamonds are graded face up.) Yellow diamonds owe their colour to traces of nitrogen found in the diamonds. Unlike the four Cs of colourless white diamonds, the strength of colour is the most important factor in determining value in champagne diamonds. Argyle Diamonds has devised the C1 to C7 colour scale to grade this type of diamond in particular. 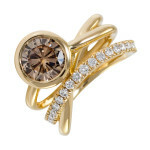 Lighter and pink-tinted champagne diamonds are highly sought, as they sparkle and scintillate more readily than darker tones. Champagne diamonds are neutral and wear well with any outfit, making them popular for everyday jewellery pieces that can be passed through the generations. Extremely rare and highly sought by collectors, blue diamonds are another coloured diamond found within the Argyle diamond mine. Their blue tint is due to a unique mix of less than one boron atom per million carbon atoms, giving them a clear, cool colour reminiscent of the ocean. Blue diamonds are highly sought the world over due to their scarcity. After two years of mining the Kimberley Argyle Diamond mine, there were just 250 carats of blue diamonds; barely enough to fill up a couple of teaspoons. A natural black diamond has colour that is the result of numerous inclusions, most of which are graphite. Due to the high amount of dark inclusions and a weak structure, these diamonds fracture easily and can be difficult to cut, polish and finish. However, black diamonds are different to other diamonds in that they absorb light rather than refract it, creating contrast that looks stunning when set next to sparkling white diamonds. They have been sourced in several locations including Venezuela, Australia and central Africa, with most of the world’s supply originating in Brazil. Many black diamonds are enhanced, meaning they have been treated with radiation to make them appear black. Enhanced and natural black diamonds look exactly the same to the naked eye in normal lighting conditions, however enhanced diamonds are actually dark green, as can be seen with a fibre-optic light source. 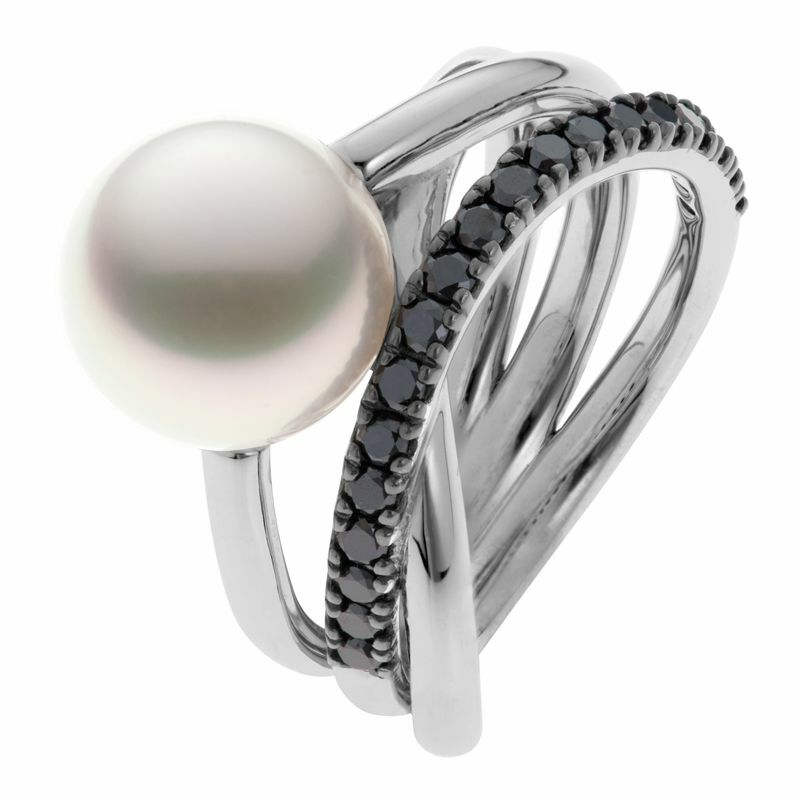 Black diamonds are growing rapidly in popularity due to their enigmatic and elegant aesthetic. 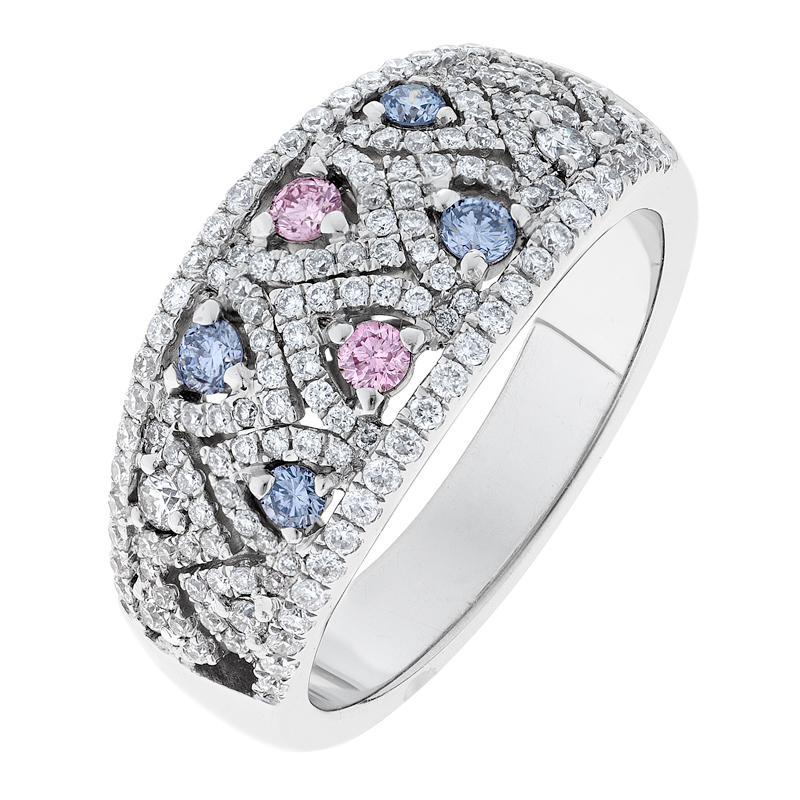 Whatever colour of diamond you prefer, there is a stunning piece of jewellery for you. View our online collection of coloured diamond jewellery here, or contact us today to discuss creating a stunning new design with your favourite diamonds for a truly special gift.